I expected this chapter to be hard on master mode because it had been somewhat of a challenge on veteran mode too. This turned out to be true, but I didn't mind. In the end it was more of a fun challenge similar to chapter seven, and far from eliciting anything like the frustration I experienced in chapter two. It started with the group of Knights of Zakuul that block the entrance to the Spire when you arrive. (The couple of trash pulls before that hadn't been an issue.) It's a group of three hard-hitting mobs with a fair amount of hitpoints, and the combination of bouncy melee and the giant walker just shooting from range makes it difficult to neatly round them up so they can kill themselves on Arcann's reflective barrier. The red circles that keep appearing around the area randomly are also veritable traps for hapless companions. When I finally managed the kill it was still somewhat chaotic. I jumped in to quickly CC one of the knights, but when I initiated combat, Senya managed to leap right into a red circle and died. Fortunately I got Arcann's barrier up in time before he could die too, which took out both the walker and the loose knight. On another class, my character being on low health and with her healing companion dead might have been in a problem at this point, but fortunately I could revive Senya and heal myself back up before engaging the final knight. The trash mobs inside the Spire were mostly as I remembered them, which is to say there is an endless stream of them and at least one of your companions will be uncontrollable and quickly storm off to commit suicide. You just gotta roll with it and accept some deaths. I was actually quite proud of myself for not dying too many times on my way up the stairs, probably fewer than I did on veteran mode. The Zakuul Knight Captain in the red armour at the entrance to the elevator hit comically hard! Several times either I or Arcann died before I even had a chance to have him put his barrier up or taunt, but eventually I managed it, at which point the captain basically blew himself up within two seconds. I reckon that if you're doing this bit with Lana and Theron, this one will probably need kiting considering how ridiculously painful all of his attacks are. And then: the dreamscape. Vaylin was fairly unremarkable again, repeating her mechanics from chapter eight. However, Valkorion himself was a different matter. I died to him many times due to approaching the fight entirely wrong at first. I figured that since you could survive some of his abilities, such as Project and Force Blast, the trick was to figure out which attacks you could absorb and which ones you'd have to interrupt. The problem was that I just couldn't figure out a viable pattern. While it's true that both Project and Force Blast are survivable in good gear, they still take about three quarters of your health off, meaning that you can't take another hit of any kind right afterwards. Plus there was always that Dark Ritual that was an absolute killer. I just couldn't figure it out. Eventually I decided to "cheat" by looking for advice on YouTube myself and I have to give credit to this video of a Sentinel doing the fight for making me see the light: You can't face-tank anything, you just gotta kite all the way, and the fact that abilities like Project and Force Blast are survivable just gives you a bit of wiggle room so you don't wipe instantly if you do eat an attack every now and then. However, you can't count on intentionally being able to do so. This is doubly true when you have to shift into light or dark alignment to be able to damage the boss, at which point you'll lose any healing abilities or damage cooldowns that you'd usually have at your disposal. Another thing I noticed is that while you keep kiting, Valkorion never even seems to try casting the deadly Dark Ritual that had given me so much trouble before. The one thing I noted here is that it seems to be random whether he shifts into light or dark first (and I only needed to survive one shift to complete the fight), but dealing with light seems to be vastly easier as the abilities you get are way more suitable for kiting. All the dark side abilities have ridiculously long cast times that make it very hard to get any attacks off while also successfully continuing to dodge Valkorion's own. Anyway, while I'm not a huge fan of endless kiting, I can't complain about a big end boss being somewhat tough to beat. I sure felt accomplished after seeing that final achievement pop up. KotFE next? Definitely at some point, but probably not immediately, as I have other things that I'd like to focus on first. It's been about couple of months since I finished all my KotFE and KotET MM chapters, so I can finally think about them without trying to smash my keyboard to pieces. Especially since I was running out of solo challenges lately. After the MM chapters, I was able to finally complete the Sprint Champion achievement in eternal championship, soloed the Colossus droid on Iokath, and also had a fun time being heal while tanking with a comp in Rishi flashpoint on MM (the final boss put up a fight). Soloing some uprisings also turned out to be tricky (especially Trial and Error), but now only the Caller in the Dark bonus fight has left. After that - what else is there to do if not to repeat my dearly hated MM chapters? 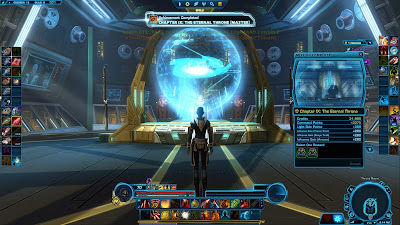 I'd be curious to hear how you soloed the Colossal on Iokath! Well, the first thing was to use all the automated turrets, rocket launchers and heroic abilities I could. Just this already eats most of his HP and brings him down to about 25% (if I remember correctly). So the problem is in killing only a quarter of a droid. The key was to break LoS, when he tried to do his long casts, hiding behind some corner, and then immediately reestablish LoS again to prevent him chasing me and coming too close, otherwise the hiding place may not work during his next attack. This can be infinitely repeated with intermissions on his rocket barrages, during which the goal is to run in a circle in such a way as to come back to the LoS breaking spot right at the end of the phase. I wasn't able to keep up doing this successfully the whole time though, so now and then he did some major damage with the casts or chase me to my spot, so I had to run to the opposite side of the battleground and find new place where I can interrupt him. In order to increase the chance of survival during these parts, both me and my comp were speced as heals. On the downside of such combination, I had to rely on my heroic abilities to do any significant damage, and it took about 5 full Heroic Moment cd's in total to kill him. Rest of the time I was just placing my dots and using weak instant attacks on a run. On top of that for final several percents I used a mounted turret (with all the boosts to be sure), but this probably didn't make much of a difference. Also using a mounted turret is a risky move, because if it expires before the droid is dead, the companion stays unsummoned. And staying one on one with a droid without healing comp most likely means quick death (which I found the hard way). I also saw a video of some other guy soloing colossus by doing mostly the same things. He was much more successful in this though, and was able to do it on a merc in dps spec, afair. So his fight went much quicker.